Cyril Childs, Editor. 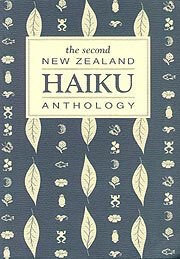 The Second New Zealand Haiku Anthology © 1998. Perfectbound, (5.5" X 8.25") 88 pages. There is now widespread interest in English-language haiku in many parts of the world. This 'small poem' genre, which developed in Japan over more than 300 years became well-known in the west following the Second World War. Interest in haiku poetry has blossomed in New Zealand in recent years. Poems by an increasing number of New Zealand writers are appearing in a variety of haiku and related publications overseas -- notably in North America, Japan, Australia, the United Kingdom and parts of Europe -- as well as in New Zealand. Over 300 of the best haiku from 35 of New Zealand's most accomplished haiku writers are brought together in this volume. In The Second New Zealand Haiku Anthology it is apparent that New Zealand writers have given haiku a distinctive Kiwi voice. Many of the subjects explored are uniquely New Zealand. Green-lipped mussels, Moutoa Gardens, a ti-tree and a gnarled black beech, wharenui, a garage sale, shearing machines, drowning a possum, rugby hookers and Te Rauparaha. All, and more, are here. Available post-paid for NZ$15, US$10, Yen 1500, UK6.50 sterling. Please order from the New Zealand Poetry Society, c/-58 Cecil Road, Wadestown, Wellington, NZ. Introduction (includes bibliography) by Cyril Childs. Haiku by John Allison, Ernest Berry, Greeba Brydges-Jones, Tony Chad, Cyril Childs, Kay Mckenzie Cooke, Elizabeth Cotton, Elizabeth Crayford, Ruth Dallas, Bertus de Jonge, pnw donnelly, Glenda Fawkes, Lindsay Forbes, Bernard Gadd, Jeffrey Harpeng, Veronica Haughey, Elena Lindsay, William Lucas, Catherine Mair, Carol Markwell, Shirley May, Peter McGregor, Barry Morrall, John O'Connor, Kevin Penberthy, Patricia Prime, Mike Shaw, Sandra Simpson, Jeanette Stace, Barbara Strang, Mark Thomas, Richard von Sturmer, Lorraine Ward, Alan Wells, and Nick Williamson.